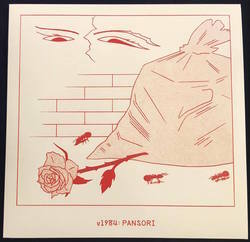 v1984 - Pansori. Vinyl 12. Planet Mu. Moving forward from last year's well received debut EP 'Becoming (N)one' on Glacial Industries, v1984 releases his debut for Knives, the label founded by Jamie Teasdale (Kuedo) and Joe Shakespeare. Jamie says "v1984 was the first artist we approached as a label, in 2014. He's been a core part of Knives as an idea, since before our first record." 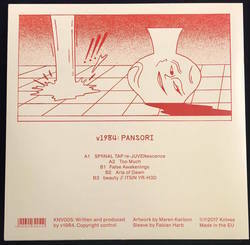 v1984, real name Christopher Ramos, is of Korean/Filipino descent and the title ‘Pansori’ reflects his Korean heritage. It has the dual translation of a 'gathering place for sound' and it specifically refers to traditional storytelling, which in turn is a neat description of the EP. The music here is delicate and meticulously laid out. Even when it approaches noise it's detailed and elegant rather than bludgeoning, like the piano and arpeggio that give way to a cold crystalline spray and shimmering drone in the opener 'SPfiNAL TAP re-JUVENescence'. The switches in mood from track to track suggest a loose narrative, even with a brief interlude in the shape of 'False Awakenings' that feels as if it's inspired by long forgotten anime soundtracks, constructed from beatless clustered pitch-shifting vocals, bells and airy whooshes. Musically the EP references both the classical music Christopher studied as a child and contemporary electronic music, but it's shattered and smeared into unusual shapes that are, in the more abstract tracks, his musical interpretation of lucid dreaming. Even the club ready tracks have an element of the sublime, such as 'Too Much' which sounds like a synthetic take on the emotional soundtracks of Joe Hisaishi with crafted contemporary hip hop beats woven in, or the damp neon melancholy of 'Aria of Dawn' which colours a mood with a simple gentle glassy melody over tip-tapping drums. ￼ The final track 'beauty_IT5INYR-H3D' draws the whole EP together, into a track that contrasts the frenzied and the elegant with crashing, whirling imp-like voices and glassy noise dragged over a tender solo piano melody underpinned by depth charge bass chords. As with every Knives release, visual communication is an integral part of this project. Berlin-based Maren Karlson's illustrative practice is absurd, technically sharp and walks a fine line between beauty and the corruption of aesthetics. Maren has provided the artwork for 'Pansori', and these traits align perfectly with Christopher's compositions. Christopher says of the EP's imagery: "There was something immediately beautiful, yet maybe a bit unsettling as well, that felt quite tangible to me and resonated within my work. For me, the image depicts some of these moments, between the real and unreal, like lucid dreaming."